The Instructions will improve over time. If you have any questions, please don’t hesitate to contact us. 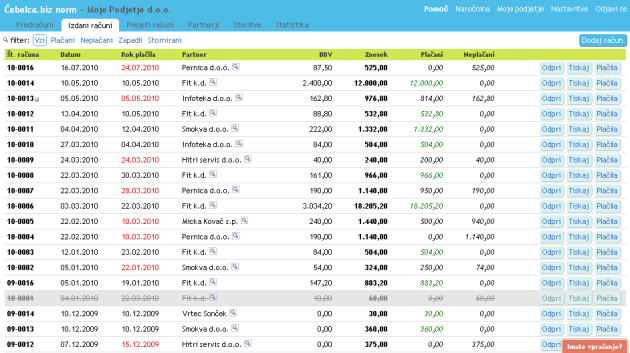 How to start issuing invoices using the InvoiceFox software? What are the functions of the buttons next to each invoice in the list? What is the function of the so-called issued invoices filters? What is the meaning of the green P-marked square next to the invoice numbers in the invoice list? How to enter corrections or other changes to contact data? What is the function of contact filters? What is the meaning of each of these buttons? A few pointers regarding your logo. To start, enter your company’s data by clicking on the My Company button in the upper right corner and filling out the form. 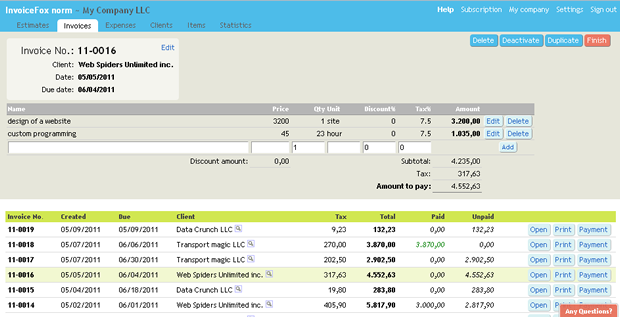 Then click on Add Invoice and input or edit the data suggested by the software. Click on Continue and proceed to enter other data (name of service, its price, amount, unit of measurement). The invoice is finalized by clicking the Add button, unless more than one service will be listed in the invoice, in which case you should use the same procedure to add other services. 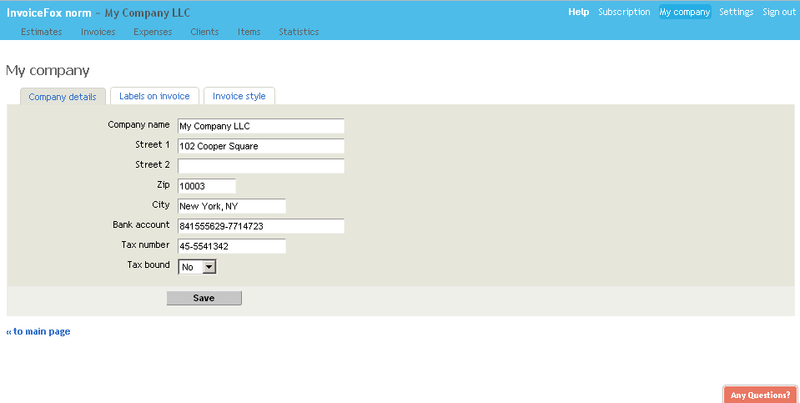 When the invoice is finalized, click on Close or Export PDF, where you can also print out the invoice. If you wish to print out another invoice using more or less the same data, use the Duplicate Invoice option. Click on Edit if you wish to edit the data in the invoice. Click on Payments if you wish to record that an invoice has been paid. You will be taken to a short form. You can confirm the payment by clicking the Add button next to the date and amount of payment. Delete: you can only delete the last invoice, while previous ones can only be reversed, leaving them in the records. Click Reverse if you wish to reverse an invoice; such an invoice, however, will not be deleted, because serial numbers of invoices have to match. The filters give you a better overview of your invoices by only displaying paid, unpaid, past due, or reversed invoices. It means the invoice is based on a pro forma invoice that is listed in the pro forma invoice list. If you wish to add a contact, click on Add Contact and enter its data. You have to add the party as a contact before you can invoice them. You can reach the data form by clicking on the Edit button located in the list of contacts. The filters are there to give you a better overview of the list of contacts, as they only display a particular category of contacts. Contacts whom you have invoiced before. Suppliers from whom you have already received invoices recorded in the list of received invoices. Passive contacts that are recorded neither on issued nor received invoices. Link to the Instructions you are reading right now. Your company’s data. You have to fill this in before you can start invoicing. Your access settings: e-mail, password. Sign out of the software. The image should be in the PNG format. You can convert it to PNG from other formats using e.g. the free IrfanView software. The image should not include transparent areas – convert them to white. Your image can be of any size. E.g. our logo is about 350 pixels wide and about 100 pixels high. However, if the image is too small, it may come across as low-quality in the .pdf; if it is too big, the PDF file will be needlessly big as well. © 2004-2013 Refaktor LTD. All Rights Reserved.